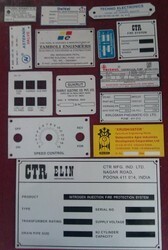 We are leading supplier and manufacturer of :- Aluminium Labels & Name Plates, Dials Scales, Control Panel Labels, etc. 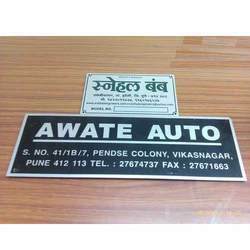 such as Aluminium Anodised Labels, Aluminium Ano-Etched Labels, Aluminium Etched Duco Colour Filled Labels and Aluminium Screen Printed Labels from Pune required for all types of machines in Electric, Mechanical, Auto, Electronic, etc. Industries. Pricing depends on Size and material Thickness and no of colors. 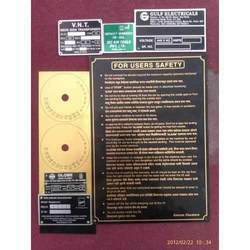 We hold expertise in manufacturing, exporting and supplying a broad range of Aluminum Anodized Etched Labels. Our product range is designed and developed by our experienced team of professionals by following strict manufacturing process. For the fabrication of these labels, we make use of high grade raw material that is procured from the certified vendors of the industry. These labels are treasured among clients for their features like fine finish, attractive look, temperature resistance and water proof nature. Leveraging on our vast industry experience, we have emerged as one of the noteworthy manufacturers, exporters and suppliers of Aluminum Screen Printed Labels. Our professionals manufacture these products using high grade raw material and advanced technology in accordance with the set industry standards. Offered products are widely praised for their features like optimum robustness, high tensile potency, resistivity to sarcastic assault and sheen look. 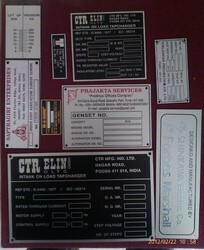 We make Labels in 11" x 8" by Fusing process specially for people having multi-coloured or shaded logos. Rates depends on size and quantity of label. 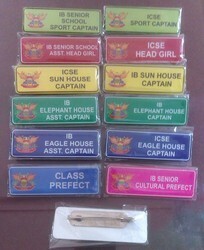 These customised Pockets Badges are supplied to Schools, Colleges, Housekeeping, Hotels, Shops, security etc. to identify personnel. These come with epoxy coating and special clips to withstand vigorous conditions. If required can be given with magnets, but we do not specify magnets as they are put on left side which affects our hearts. 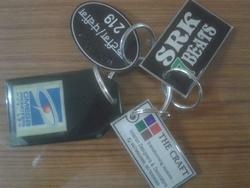 We Manufacture Keychains in Aluminum Etching, Screen Printing or Digital printing in 16 swg or 20 swg. with or without Epoxy coating. 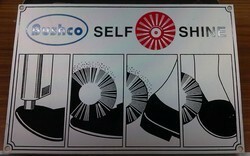 We are offering Aluminum Etched Color Filled Labelsto our valuable clients. specification Duco color ( Thinner Base ) is filled in place of anodized color, for labels used for outdoor purpose. We always try to provide quality products to our clients. We make digital prints pased on Aluminum or St.Steel epoxy coated labels for branding of customer's products. 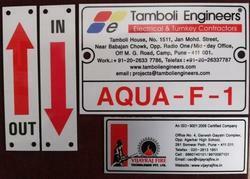 We make Name Labels for product identification on Aluminum, St.steel, Brass, Copper as per required by customers. 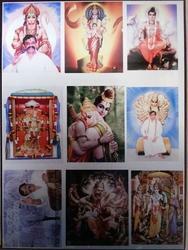 We make photos in aluminum 24 swg by fusing process in 11" x 8". Rates depends on size and quantity. We manufacture Aluminum Tags in 40 swg to 16 swg required for various industry as per customer's specific requirement only as per their drawings given to us. We can also make tags in different colors as per requirements. We have Engraving facility for the nos.to be put on tags. 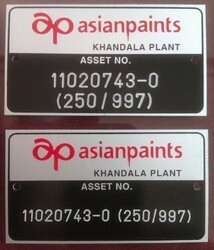 We make Aluminum Anodized customized Labels as per requirement. 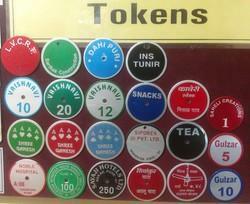 We Manufacture Tokens for Banks or Post Offices or Gold Shops on Brass 16swg / 20 swg and Others ( Post Offices, Gaming Clubs, Medical Centres, Clothes / Saree shops, Snacks Centres, sweet marts, security, Malls, etc.) Alu Tokens in 20 sw to 16 swg, St.Steel in 24 swg, Copper 24 to 20 swg. We have many clientale of multistate co-op. banks/ co-op. credit societies, nationalised banks etc. for their different branches.